Friends and neighbors continue to voice their opinions about the potential sale of a portion of the Myers Park parcel. Sossong: Balance natural landscape with development – Sossong, K. (2017, February 4). Tallahassee Democrat. Brezin: City should reject Myers Park rezoning – Brezin, M. (2017, February 3). Tallahassee Democrat. Myers Park rezoning – who wins? – Livingston, E. (2017, February 2). Tallahassee Democrat. 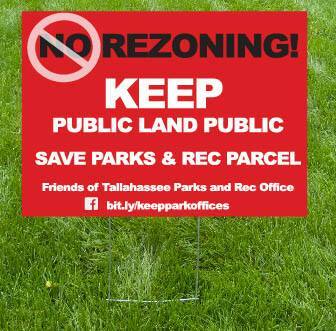 Dawson: Public land in Myers Park should not be sold – Dawson, G. (2017, January 5). Tallahassee Democrat. Homeowners object to planned zoning changes – Schweers, J. (2017, January 2). Tallahassee Democrat. City Commission voted to damage Myers Park neighborhood – Clark, J. (2016, November 5). Tallahassee Democrat. development, Myers Park, proposal, sale, zoning. Bookmark.